I don't know what it's like where you live, but summer arrived early here! We've been touching triple digits this week, so you know what that means? New summer recipes for play! The boys had so much fun painting with ice chalk and oil the other day, so when I saw the weather forecast for the week I thew another batch of ice chalk in the freezer. 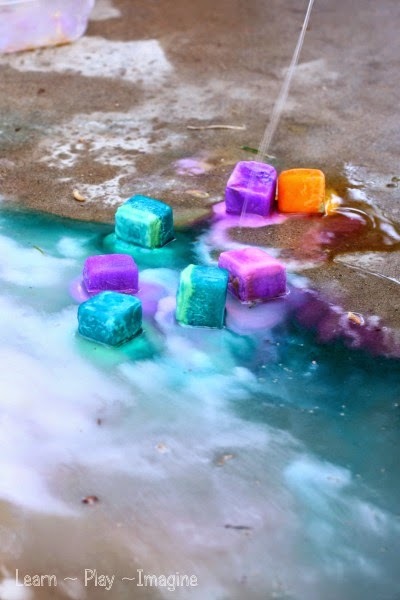 This time I decided to create a new recipe for play and make it erupting ice chalk! After all, who doesn't love a good erupting paint recipe? 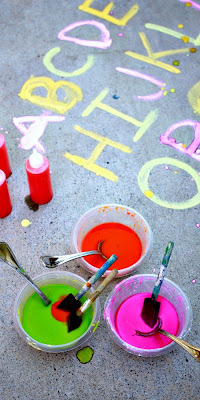 Directions: I made our erupting ice chalk paint using the same recipe I used for our erupting sidewalk chalk paint. The measurements do not have to be exact, but for the sake of ease I used a 1/4 cup measuring cup to scoop out the baking soda and cornstarch. I used 1/4 cup of each, squirted some liquid watercolor paint on the mixture, then topped it off with 1/2 cup of water. I mixed well with a spoon then poured the erupting paint mixture into an ice cube tray and stuck the trays in the freezer until today when we had time to paint. I hosed off our back patio and set the erupting ice chalk in bins and invited my boys to paint. Wetting the cement isn't necessary, but it helps the ice chalk melt and spread faster. It also showcases the gorgeous blending colors more easily. While JZ (6) wanted to paint and try out each color, my toddler twins, Tank and Peanut (34 months) mainly just wanted to play with the ice and build towers. Tank wanted all the orange and purple ice cubes for himself. The beauty of ice chalk on a hot day is that even without intentionally painting, the colors melt and mark the ground beautifully. Seriously, is this not the most gorgeous chalk you have ever seen? Thank you Reading Confetti for the original inspiration to make ice chalk. We have enjoyed countless hours of outdoor play while managing to beat the heat. Once the ice chalk has sufficiently melted and mixed, it's time to bring out the squeezy bottles of vinegar. If you don't have squeezy bottles you can use spray bottles, cups, bowls, or really any container. Squeezy bottles are just so dang fun, and they have the added benefit of boosting fine motors skills. While painting I encouraged the boys to keep their artwork to one central location on the patio, so we could achieve larger eruptions, and it worked! JZ and Tank enjoyed making the ice chalk erupt right in their hands. They took turns squirting. All of the ingredients are safe to touch, but please be sure your children don't touch their eyes. Erupting ice chalk turned out to be the perfect recipe for play on this hot day. When we were done painting I simply rinsed off the patio with our backyard hose, easy peasy. For more summer recipes for play follow me on Pinterest. Does this wash off the kids easily? Looks like a lot of fun! Thank you, yes! It rinses away easily with water. If you use food color it could stain the hands for a day or two. We used liquid watercolors. Even the food coloring comes off before too long, though. Why the corn starch? Wouldn't the effects be better at 1/2 cup baking soda and no corn starch? Just curious. I've never made my own before. Is there a way to print off the ingredient list and directions without the pictures? Just trying to save on ink! highlight the reciepe then when you go to print select the print selection button and it just just print the part you want. Very creative - I haven't heard of anything like this before! where can I find liquid watercolor paint? Amazon also carries other brands, although I have not tried them personally. I have not seen liquid watercolors in stores. I love this!! we will try today! Thank you for sharing. I think squirt guns sound fun for this! What was the ratio of vinegar and water in the squirt bottles? I don't think I used any water, but it could be added to make the vinegar stretch.